I wanted to do some funky long exposures this week (skateboarders, kids on slides/swings etc) but it was bright outside and I don't have a filter for the lens. Also: wind does not make for a steady tripod. 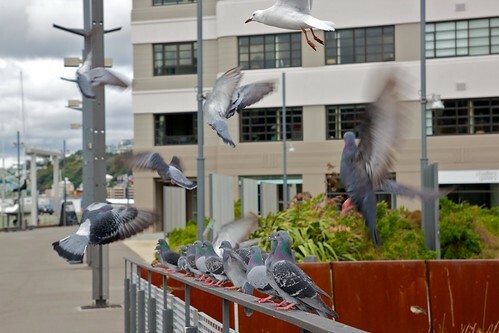 I was wandering around near Te Papa and stopped to take some pics when a whole pile of pigeons (and one seagull) flew in and perched right next to me. Win! Movement, originally uploaded by rattyree.